Valentine’s Day is quickly approaching. What do you like to do for your sweetie on Valentine’s Day? My husband and I don’t spend a lot of money on this holiday because we feel like everyday we should show each other how much we love one another. However, that doesn’t mean that I won’t bake up something special to show him how much I care. 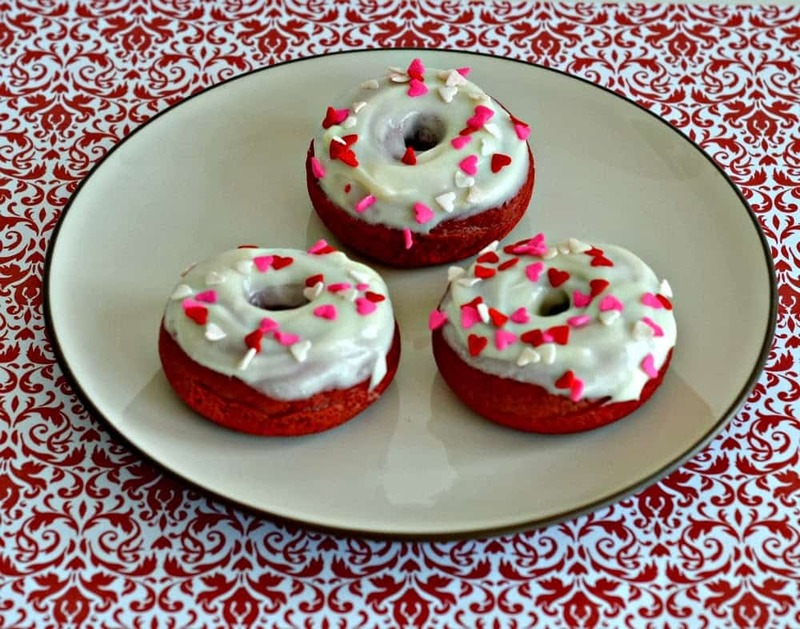 An easy and delicious way to start Valentine’s Day morning off right is with these baked Red Velvet Donuts. 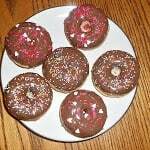 These donuts are baked, not fried, so not only do they not make a big mess, they are much easier on the waistline as well! 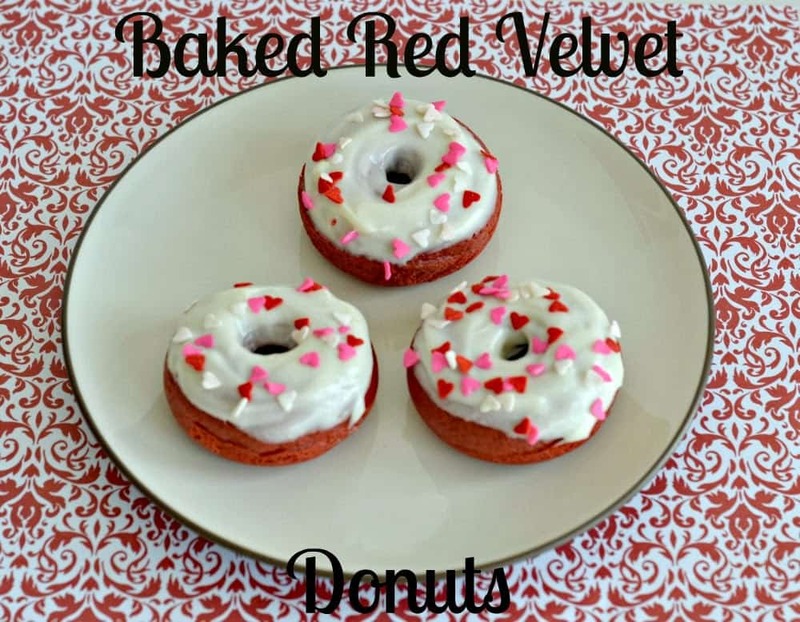 The cake donuts have the classic red velvet mild chocolate taste and are glazed with a light cream cheese frosting. Then I sprinkled on some pretty heart sprinkles to finish them off. 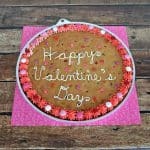 Surprise your loved one this Valentine’s Day with a few of these sweet breakfast treats! 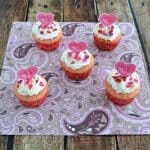 Of course, if breakfast isn’t your thing, these are also perfect for sharing as an after dinner dessert. 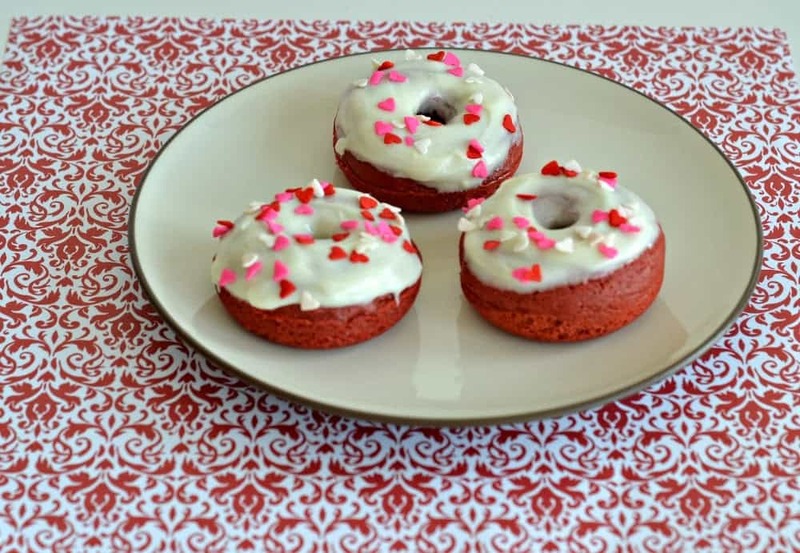 As a side note, go with the AmeriColor gel paste to make these donuts red. They are not sponsoring this post in any way, I just love their product that much. I used to use regular red food coloring and have to use an entire bottle to get it sort of red looking. With the AmeriColor Red gel paste I use a few drops and get a bright and beautiful deep red color. Totally worth the money and one item I could not bake without! 1. Preheat the oven to 350 degrees. Spray a donut pan with cooking spray and set aside. 3. In a large bowl mix the sugar, egg, and vegetable oil together. Add in the cocoa powder and vanilla and mix well. Slowly stir in the milk until well combined. 4. Add in the dry ingredients, about a half cup at a time, stirring well after each addition. 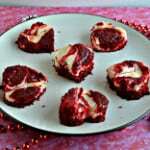 Add in a few drops of red food coloring and mix until the batter is the desired color. 5. Put the batter into a zip top baggie and seal. 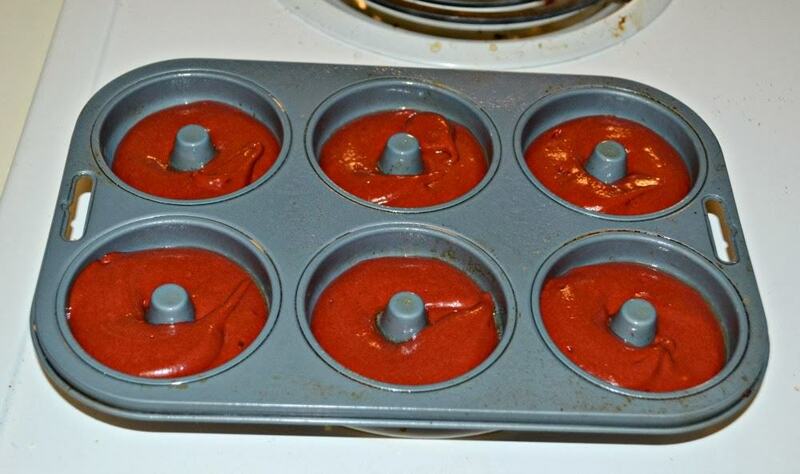 Cut off the end and pipe into the donut pan, filling each donut cup 2/3 of the way full. 6. Bake for 12-15 minutes, making sure the donuts do not brown. 7. Cool slightly and remove from the pan. 8. To make the glaze heat the cream cheese in the microwave for 20 seconds. Stir well. Add in the powdered sugar, vanilla, and food coloring if desired. 9. 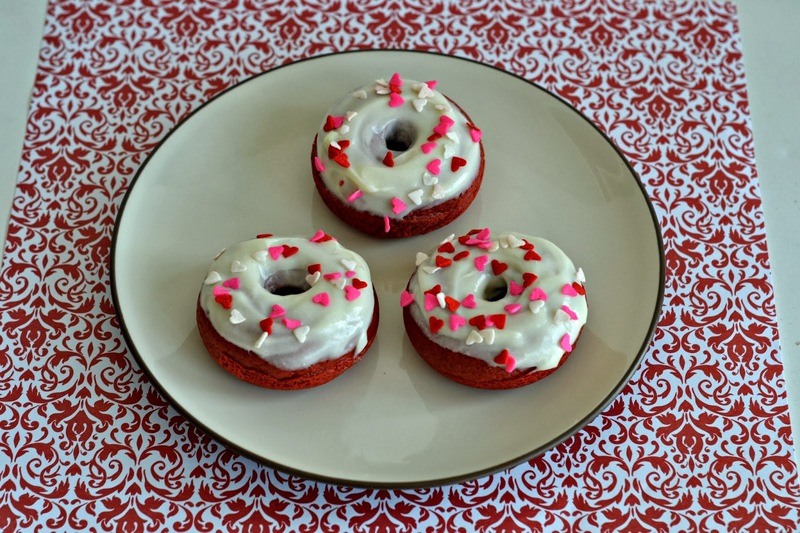 Dip the tops of the donuts into the glaze and sprinkle with hearts or sprinkles. These are best served the day they are made.